Multiplication is an incredibly important math concept for young mathematicians. 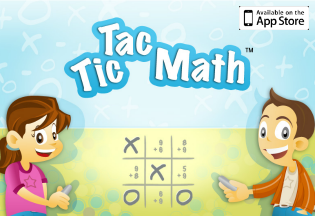 It can aid in counting and problem solving, as well as helping kids increase their number sense and pattern recognition. When you are trying to teach multiplication, however, there are about a million different ways to approach it. Rather than trying to find the best method, why not give kids all different kinds of opportunities to see and make sense of multiplication? 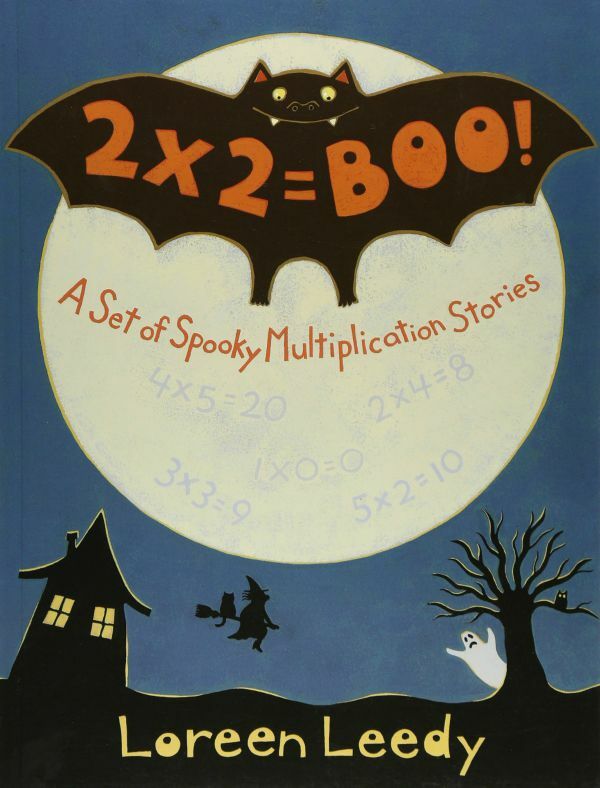 Today, I want to share hands-on multiplication fun with the not-so-spooky Halloween story book, 2×2=Boo! This book includes stories to help introduce kids to multiplication from 0-5. It helps show kids multiplication as groups of equal parts, in ways that make sense in real life(ish) situations. For example, when showing what it means to multiply by three, they build three scarecrows. And so each scarecrow needs one head (therefore, 1×3 = 3 heads), then each needs 2 eyes (therefore, 2×3 = 6 eyes), etc. Even though my daughter is in first grade and I’m not focusing on understanding (or memorizing) multiplication facts right now, she is starting to notice patterns when counting or adding. For example, the other day she was counting something and when I asked her how she knew the answer, she said, “Well, I know that three threes is nine.” She had simply made that observation on her own, and then used it to solve a problem. So we read this silly book together and had some good, early discussions about what multiplication is and why it’s useful. 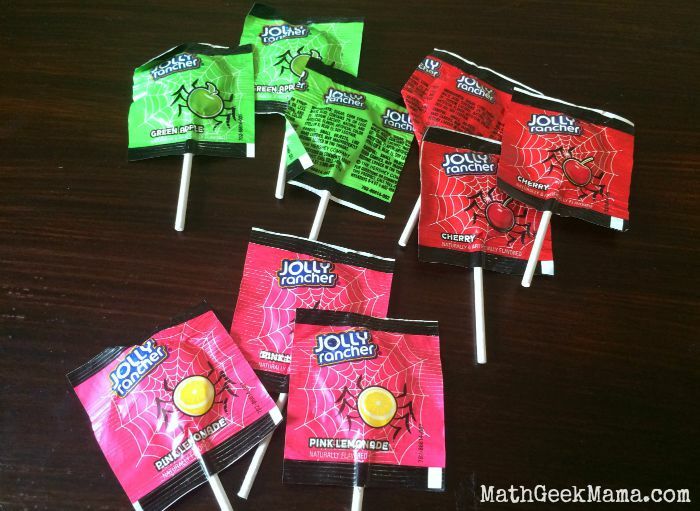 Then we got out some of our Halloween candy and practiced some hands-on multiplication! 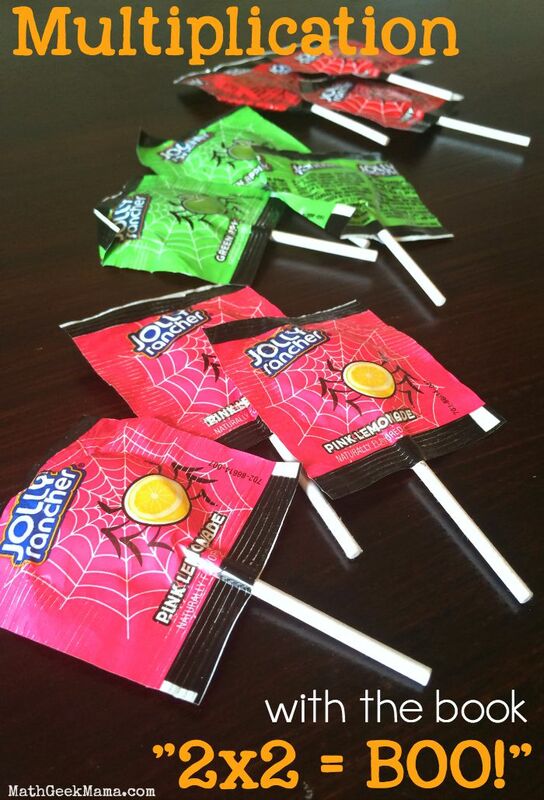 I started with lollipops because we had a few different flavors. We split them into equal groups and talked about how to count them. I would also ask her to show me solutions, such as 2×3 or 1×5, and see if she could group them. 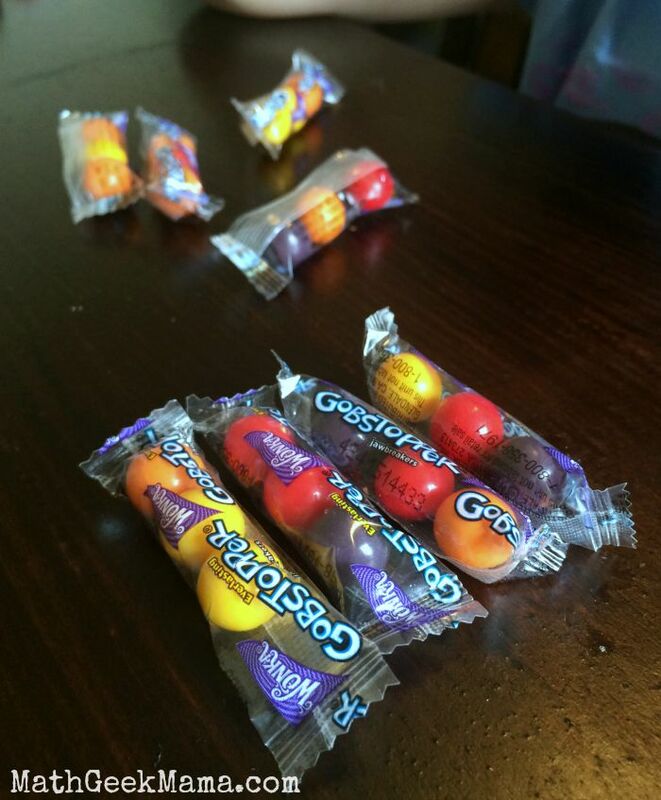 Then we moved on to gobstoppers, because they had 3 candies in each package. 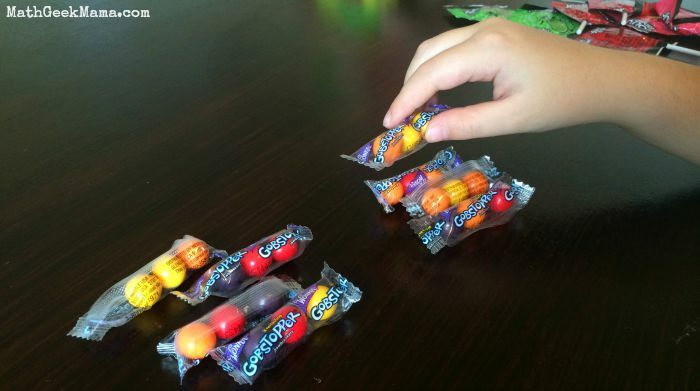 So I first asked her to show me 2×4, and we talked about how 2 piles of 4 packages was equal to 8 packages of candy. We started with just one of the piles of 4, and worked on counting by 3’s. Once she saw that 4×3=12, we worked on counting all the packages by 3 to find the total. I could tell that it got her brain thinking, but also left her a little confused still. But it was a great and fun introduction to multiplication! While we had fun using this book and different kinds of candy, you certainly don’t have to. 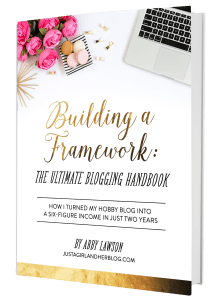 You can practice grouping with base ten blocks , pom poms, legos , stickers, anything at all that you have around the house. And if you don’t like the Halloween theme, or can’t use it in your classroom, Amanda Bean’s Amazing Dream is another fantastic multiplication story that helps kids see the importance and usefulness of multiplication. Want more practice? 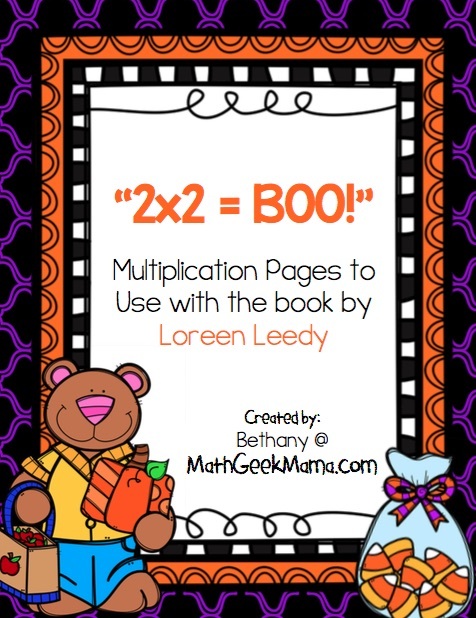 I created some multiplication pages to go along with this story! The goal of these pages is to have students find the solution by drawing equal groups of each object. For example, the first problem is 1×4 and shows 1 candy apple. Students are then to draw 1 candy apple 4 times, to find the solution. Please Note: I want these practice pages to be useful for everyone, so there is nothing spooky on them. I tried to just use Fall-themed objects, such as leaves, candy, pumpkins, apples, etc. This activity has been updated and included in my HUGE Introduction to Multiplication lesson bundle! 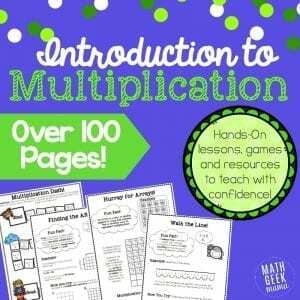 Everything you need to teach multiplication and build a strong foundation for students! 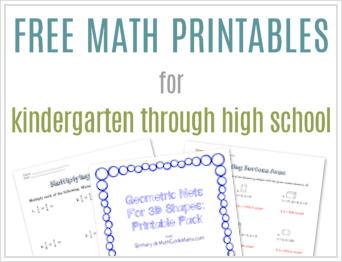 And if you’re looking for more multiplication resources, check out this post with more ideas, or subscribe to my FREE weekly email newsletter to get free teaching resources you won’t see anywhere else (including a multiplication matching game)! 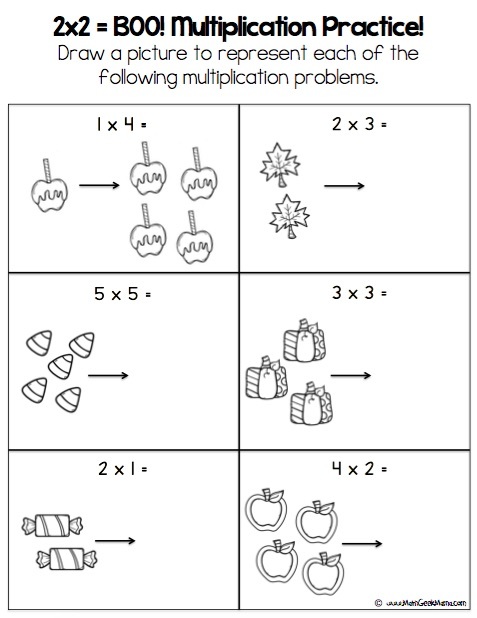 Plus, get easy, low prep multiplication games here! Love each of your printables. Thanks a ton for sharing them.